One of the most gripping pieces I saw at Arizona State University last week had no music. Of the 47 works presented in the West region of American College Dance Festival (I was one of three adjudicators), only this one was in silence, while many were performed to music that overwhelmed the dance. This was a duet called Alpha, made by two guys from Grand Canyon University who looked more like wrestlers than dancers—Adam Astorga and Christopher Biles. Each decision about their contact points was crystal clear. The silence allowed you to see first how they leaned against each other back to back in visual harmony, then how they engaged in an ambiguity that mixed combativeness with affection, and finally all-out brutality, butting and crushing each other. The times when they stared each other down, nose to nose, were intense because you could see hostility mingled with affection…maybe even love. None of the complexity was lost or blurred. And in the end, the winner, after defeating his opponent/friend, slowly lowered his head in…doubt, shame, and maybe reflection. Thankfully there was no music to sentimentalize or dramatize that moment. Back in the 1970s when I was making dances with Susan Rethorst, we often chose silence. Today she is one of the few choreographers who can carry it off and create a mood without music. I think it has to do with the everyday-ness of her gestures, done at just the right moment to reveal something about the performers and their relationship to their environment. I think that music, any music, would impose itself too much on such subtle moments. Of course, we know from John Cage’s book Silence that pure silence doesn’t exist. “There is always something to hear. In fact, try as we may to make a silence, we cannot.” So, even if there is no music, we are hearing ambient noise, and that is the accompaniment. That gave me a clue to how Trisha thought of her dances: as equal to visual art works. 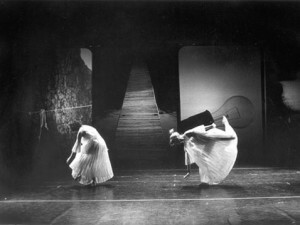 Even when she started choreographing for the proscenium stage, she regarded her dances more as art than entertainment. For her first stage work, Glacial Decoy (1979), she enlisted the help of visual artist Robert Rauschenberg. He projected a panel of ever changing photographic slides that moved from stage left to right across the backdrop. The dance also shifted from side to side, spilling out laterally. Together, the art and the dancing created the illusion that the piece kept going beyond the proscenium frame. If there had been music, you might not be able to discern this brilliant, convention-breaking concept. Not to mention that the shifting projects gave it a definite rhythm. As for the audience response, usually you can hear a pin drop during this piece. Some presenters think their audience won’t sit though a silent piece. But the Paris Opéra Ballet took a chance with Glacial Decoy, which was set on them by Lisa Kraus—and the French audience did not riot. In the ’80s the Joffrey Ballet acquired Jerome Robbins’ Moves (1959), which is now in NYCB’s rep. The silence seems to put every wrist rotation, every stomp, every bit of partnering into high-definition. By the end, you almost feel exhausted—but exhilarated. You feel like you know so much about each dancer and and the relationships between them. Mark Morris, known for honoring his chosen composers through dance, recently revived his 37-minute composer-less Behemoth (1990) at BAM. As with Moves, I felt the sound of silence allowed the details to be sharply etched in space. I was so continually intrigued by this piece that it made my “Best of 2010” list. Yes, we all love music; it’s a bone-deep, basic pleasure. When a child hears music she or he bounces or sways along. As dancers, it is music that spurs us to move, engages our muscles, and carries us on its momentum. As choreographers, our work is immeasurably enriched by music. But I do enjoy the stark clarity that silence can bring to what I am seeing onstage. Tell me about your favorite silent dances. I’ve made a number of pieces in which all the sound is made by the dancers, that’s not silence, of course, though apart from the dancing there is only silence (in the Cagean sense.) It is bracing to share the same sound environment with the audience. The lack of that intervening curtain of sound made by musicians or recordings brings an immediate intimacy to all that we do.